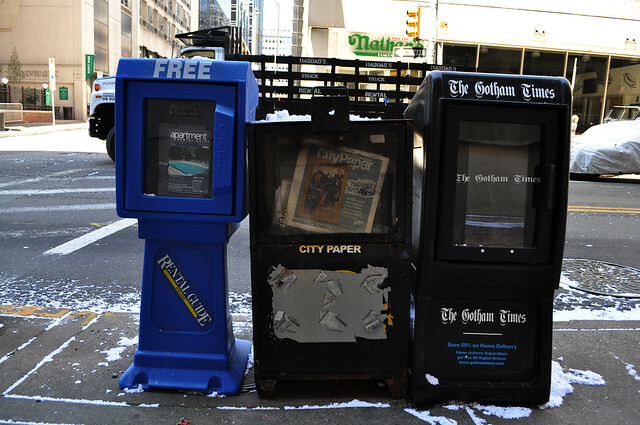 Internet, on a scale of one to impossible, how hard would it be for me to steal this Gotham Times newspaper dispenser for my home office? Also, does anyone have a dolly I can borrow? And a batmask? And a cape? When you hear on the news that someone dressed as Batman stole the Gotham Times newspaper dispenser and drove off in a momdorkmobile, it totally wasn’t me. It was probably that Petunia Desperado. Someone has GOT to get you a cape to run around and swish in… or is that ‘swish around and run’? To hell with the newspaper dispenser. Where is that Nathan’s Hot Dog place? I’m coming to the ‘burgh next week and I want a Nathan’s Hot Dog. Maybe you can read about me eating it in the Gotham Times. Need a van to pull up next to it, have someone inside to assist in putting it in the van. Should only take a couple minutes! How about a Batgirl costume with a cape? That I can hook you up with. Gman- the nathan’s hot dogs is @ 305 Wood Street. Open 7am to 7pm. Hot dogs at 7 AM. Is this a great country or what? I believe that @scarletfire has a Bat Girl mask that she would be willing to lend you. I also believe that @burghbaby is working on Ginny’s cape, bluzdude. G-Man – If you really want a good hot dog with ‘burgh personality go to Franktuary. You will not be disappointed.